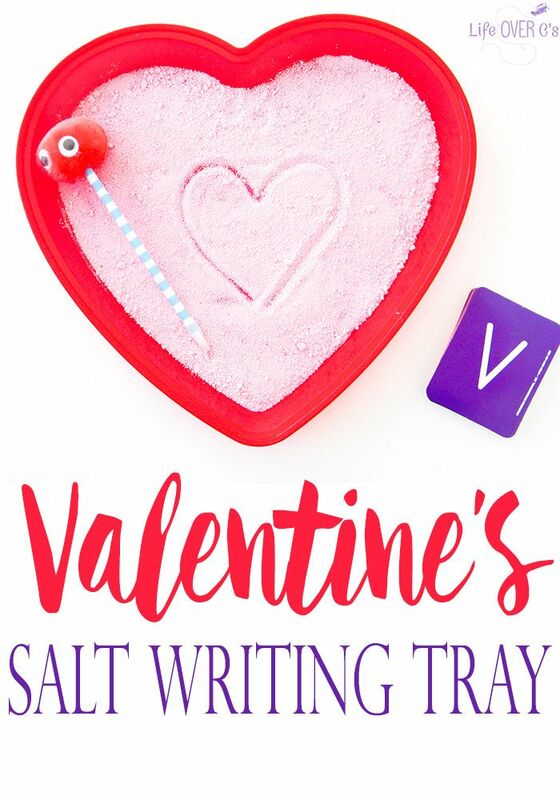 When I found this heart-shaped tray at our local dollar store, I knew right away that I wanted to use it to create a Valentine’s Salt Writing Tray! This adorable salt writing tray is the perfect idea to spice up your child’s writing and fine motor practice! Color the table salt pink using pink food dye or a little squirt of pink tempera paint. Mix up with salt and coloring really well, then set it out to dry. If the salt gets a little clumpy, just break up the clumps with your hands. Once the pink salt is dry, fill the heart-shaped tray with a layer of salt. 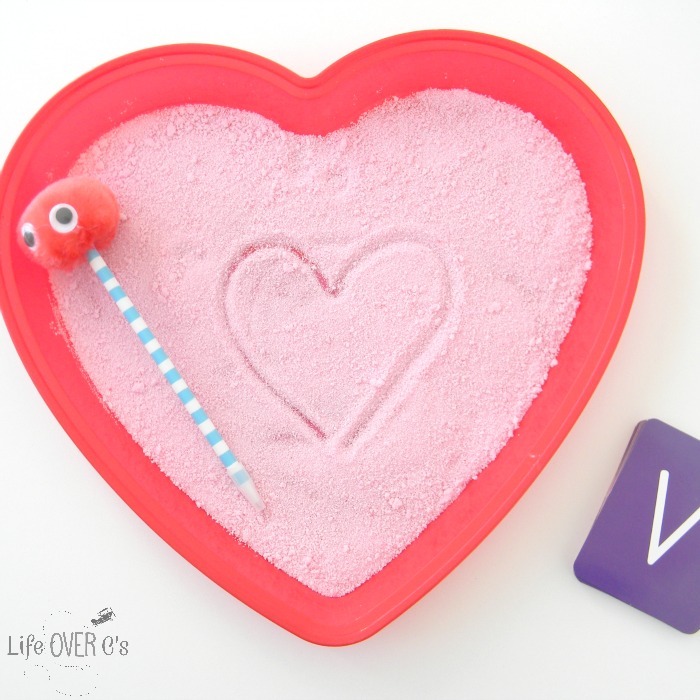 Add a cute Valentine pen or pencil and set out the tray with some alphabet flashcards. Then, invite your child to practice writing some letters or sight words in this great sensory salt tray! Once your child has sat down at the table with the salt tray in front of them, encourage them to pick up the writing utensil using a tripod or modified tripod grasp. It is appropriate for kids ages three and a half to four years of age to still use a modified tripod grasp (shown in the picture above). Children over the age of five should really be encouraged to hold a pencil using the correct tripod grasp. Practicing handwriting and proper pencil grasps with a salt tray makes this more fun! Once the child has an age appropriate pencil grasp, have them practice writing some letters. Use the alphabet flashcards to show the proper shape of the letters and to select letters for your child to write. Children can also use their pointer finger to practice writing letters for more sensory input. 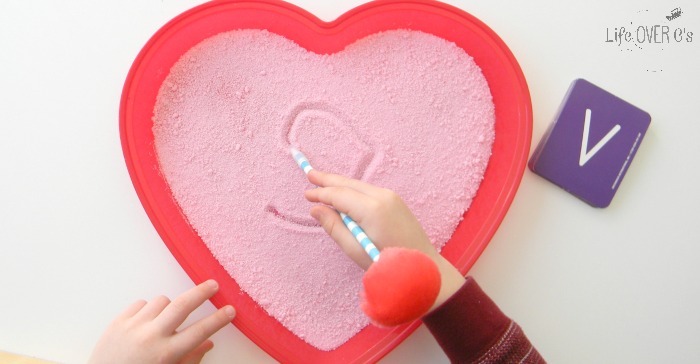 If writing letters or words in the salt tray isn’t of interest to your child, they can still practice fine motor skills and proper pencil grasp. Just encourage the children to draw up and down lines, side to side lines, zigzag lines, wavy lines, swirly lines and circles or other shapes. The salt tray can even be used for drawing pictures! 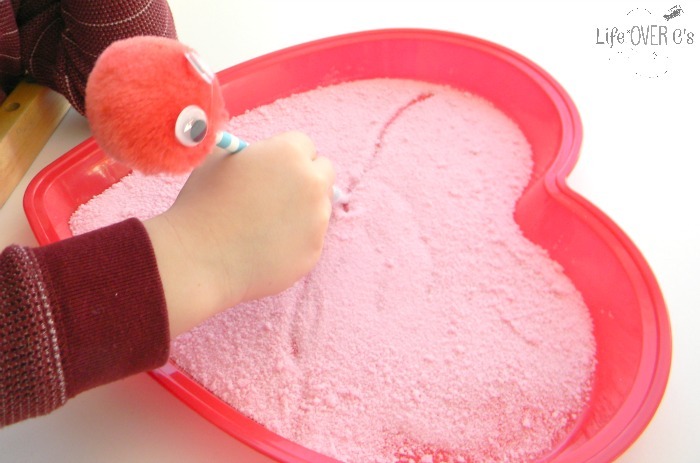 However your child uses the Valentine’s salt writing tray they will still be practicing fine motor skills and having fun! For more Valentine’s Day fun, check out our Valentine’s I Spy!